Public school districts (non-charter) using a P.O. may have 30-day terms (payment by check). Email your order to orders@schoolsavers.com or fax to (562) 988-0888. You do not need to enter your order on-line. Freight is $75.00 per shipment address. AK, HI call for rates. One wireless network adapter connects to one TI-Nspire CX or TI-Nspire CX CAS handheld Power wireless network adapter through the TI-Nspire CX or TI-Nspire CX CAS handheld. 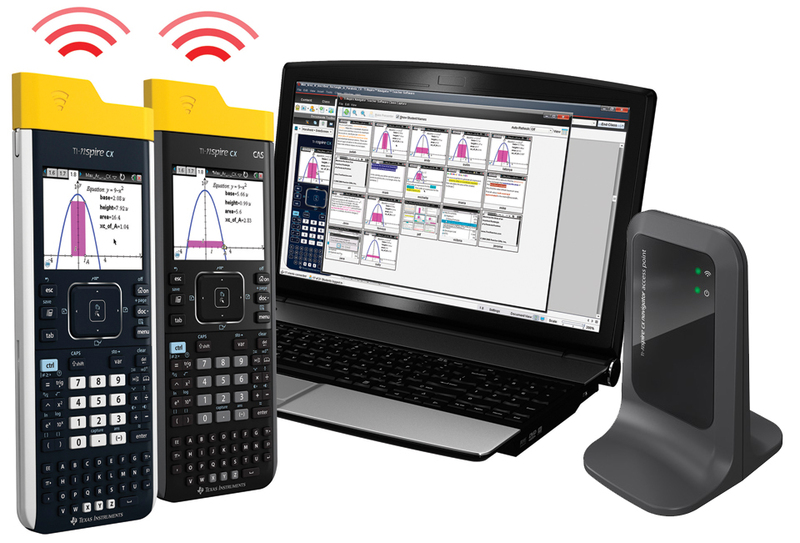 Compatible with a single classroom setup of TI-Nspire CX handhelds and/or TI-Nspire CX CAS handhelds. Review and analyze each student’s answers. View a class summary, a student-by-student analysis or an item-by-item analysis. Slideshow capabilities allow anonymous viewing of class results. Upgrade operating systems on all students’ handhelds at one time. Collect, grade, save and record each student’s work. Create multiple-choice questions to quickly assess student understanding. Quick Poll feature gathers instant feedback from students and provides educators the ability to instantly assess student understanding. Screen Capture feature gives educators and ability to capture screen shots of each student’s graphing calculator to monitor work. Includes TI-Nspire Navigator Teacher Software and TI-Nspire CAS Navigator Teacher Software. Real-time feedback and instant assessment of student understanding. Monitor student work to ensure everyone is on track and on task. Facilitate an engaging, collaborative learning environment. Quickly send data or apps to students. Auto grade student assignments and tests.